Stegosaurus is a genus of stegosaurid armoured dinosaur from the Late Jurassic period (Kimmeridgian to Early Tithonian) in what is now western North America. In 2006, a specimen of Stegosaurus was announced from Portugal, suggesting that they were present in Europe as well. Due to its distinctive tail spikes and plates, Stegosaurus is one of the most recognisable dinosaurs, along with Tyrannosaurus, Triceratops, and Diplodocus. 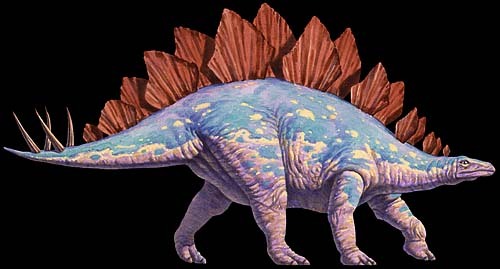 The name Stegosaurus means "roof-lizard" and is derived from the Greek στέγος-, stegos- ("roof") and σαῦρος, -sauros ("lizard"). At least three species have been identified in the upper Morrison Formation and are known from the remains of about 80 individuals. They lived some 155 to 145 million years ago, in an environment and time dominated by the giant sauropods Diplodocus, Camarasaurus, and Apatosaurus.